I've always been a fan of Sheinside but I can't get over how good they are at the moment. Warehouse had in the most amazing white waistcoat but, at £85, it wasn't going to get to come home with me. Despite this, I made up outfits in my head with it and occasionally dreamed about it too. Ok, that last part's not true but, had it happened, I wouldn't have been surprised. Anyway, when this lookalike popped up on the Sheinside website I thought it was too good to be true, especially at only £15. Now I'm free to make all those outfits I had in my dreams real, HUZZAH. Gorgeous outfit... I am in love with your necklace! Love this! Brilliant substitute for the warehouse one in their ad campaign, and adore that necklace! 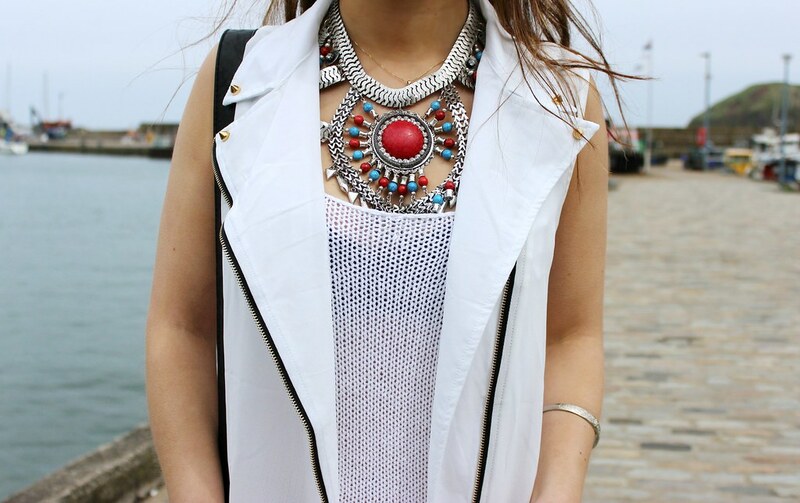 I love this massive necklace! Keep up with your blog, I love it! You're doing an amazing job! The necklace is just incredible! You really remind me of Kristen stewart, you probably get that a lot lol! Gorgeous outfit, love the style. That necklace is amazing. You've just reminded me how badly I want those boots...I also love Dannijo (and Fiona Paxton)! Love love love that waistcoat!! So good for the price! I also need those topshop boots in my life! i want every single item from this outfit so baddd, perfect outfit! suffering from serious waistcoat and hair envy, you look so effortlessly cool! amazing outfit. Suits you so good. you can literally do no wrong ! !